4/29/11: Dr. Frances Gulland is Sworn into The U.S. Marine Mammal Commission! Dr. Frances Gulland, senior scientist, at The Marine Mammal Center. Dr. Frances Gulland, senior scientist at The Marine Mammal Center, was sworn in as a U.S. Marine Mammal Commissioner on April 29, 2011. Overlooking breathtaking views of the Pacific ocean at Ft. Barry, Golden Gate National Recreation Area Superintendent Frank Dean graciously administered the oath. About forty people gathered to take in the joyful occasion as a gust of wind blew across the faces of those taking in the moment. A historic Bible that may have originally been given to King Edward and a first edition of Darwin was used to aid in the giving of the oath. The proclamation from the White House bore the original signatures of both Hilary Clinton and President Obama. The Golden Gate Bridge was the backdrop as Dr. Gulland's husband Andy Draper was by her side to celebrate this important milestone in her career. Now it’s official! The Center’s very own Dr. Gulland is appointed, confirmed and sworn in as a Commissioner. Congratulations, Dr. Gulland! The Center is proud of your dedication and looking forward to sharing your expertise and passion with an even larger audience through this exciting accomplishment. 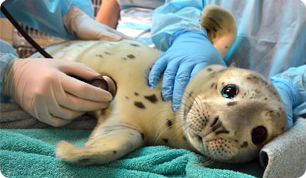 Learn more about marine mammal gunshot victims and the research being done by The Marine Mammal Center to stop these senseless crimes.